Episodes like our squirrel adoption, along with a large cast of talking animals on children’s television, surely helped nurture my interest in whimsical cartoon critters. There was considerable delight in having a rapport with this rodent. Maybe I imagined myself as one of the human co-stars mingling with Tennessee Tuxedo, Yogi Bear, Rocky and Bullwinkle on Saturday morning TV. 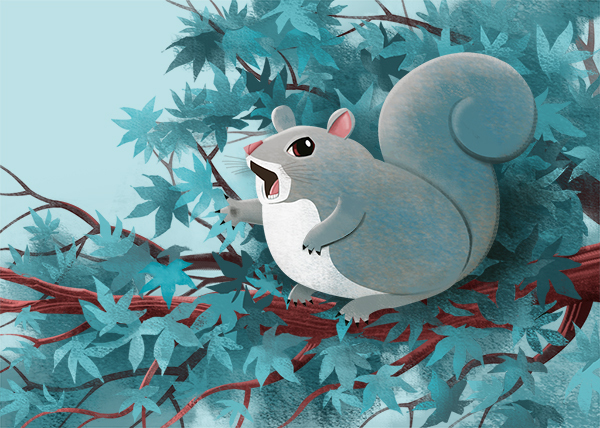 Enjoying a bit of free time, I imagined a squirrel settled high in a tree, and spontaneously breaking into song. Squirrels sometimes make a faint chirp, but how great would it be if they could belt out a tune? This one has stage presence, with arm extended, bellowing the last line of “My Way”. They get to pick the tune; I only illustrate them. Sing your heart out squirrel. Your handful of nuts is on the way. Where can I buy online uk http://www.opsint.com/wp-docs/pharmacy/domper.html get cheap online. Where can I order generic online http://www.davejohnsondesign.co.uk/online-payments/pharmacy/sintisone.html find cheap generic. Where can I buy online safely http://www.angiemcampbell.com/wp-docs/pharmacy/ciprohexal.html buy medicine online. Prices in canada http://www.wendydaws.co.uk/wp-content/pharmacy/acecat.html order online canada mastercard. Actually, the squirrels have been driving us crazy lately. We cannot enjoy feeding our birds anymore. I will send them all to your house…. There must be a reason that no part of this story seems unusual for you Ed. Don’t know if he would be singing “My Way’, but it opens the door to a whole host of squirrel jokes and lyrical commentary.